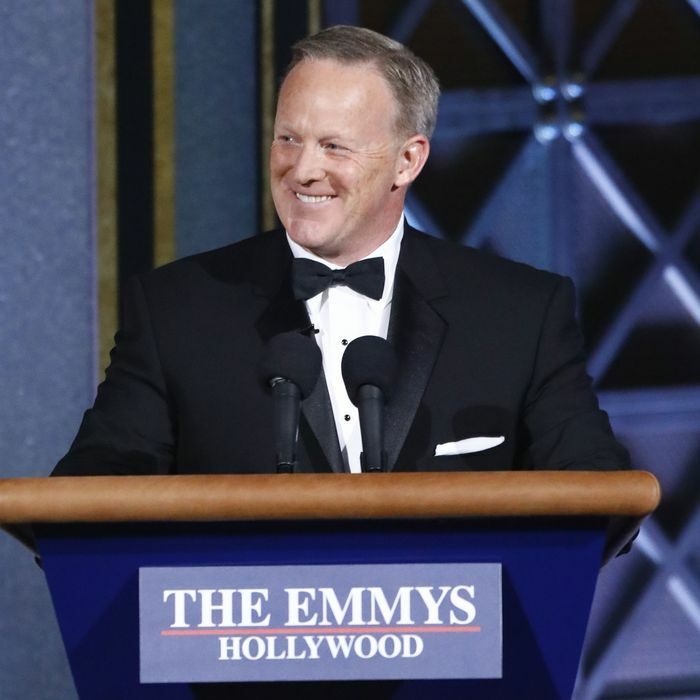 Sean Spicer’s Emmy cameo was instantly iconic — and immediately controversial. Sunday night’s sudden appearance by the former White House press secretary prompted laughter and applause inside Los Angeles’ Microsoft Theater, but it also resulted in scorn from left-leaning Twitter and more than a few professional TV critics (including our own Matt Zoller Seitz). Detractors argue Colbert and the TV Academy “normalized” Spicer by allowing him to poke fun at his White House tenure. Colbert isn’t talking, but according to a source on the Emmy production team, neither the comic nor his team are shocked at the response. “We had eyes wide open that … there would be people who thought we shouldn’t do it,” the insider tells Vulture. “There was no expectation everyone would love this.” So why go forward with a bit likely to drum up online outrage? One word: comedy. Colbert has established bona fides as Donald Trump’s tormenter-in-chief: CBS’s Late Show star has been network TV’s fiercest comedic critic of both candidate and President Trump, serving up nightly takedowns of POTUS and everyone in his administration — including Spicer. And he didn’t tone things down on Sunday’s Emmy Awards, even though past hosts have sometimes downplayed political humor in order to avoid alienating viewers on either side of the political spectrum. The bit in which Spicer appeared was, in fact, part of a bigger joke about the president: He’s so insecure, he had to order a staffer to lie about the inaugural crowd size. According to our source, enlisting Spicer to appear was a way to “double down on the joke,” to make the point even more effectively. “We made him the joke,” our production source says. “We made him the joke at the Emmy Awards.” In other words, as much as Colbert has become known as a Trump basher, he remains at heart at comic who’s forever looking to prompt the biggest laughs and to make the biggest splash with a gag. “It was in service to a joke, and [Spicer] was the joke,” our source said. It’s worth noting that Colbert wasn’t the first late-night host to give Spicer a forum in which he might possibly seem more … human. Just last week, Jimmy Kimmel conducted the first late-night interview with Spicer since his White House departure, a fact Colbert brought up when he made his own Kimmel appearance as well. Indeed, when Kimmel told Colbert “a certain part of me felt sorry for” Spicer, Colbert seemed surprised. “Really?” Colbert replied to Kimmel. “He wants to be forgiven but he won’t regret anything he did. You gotta regret something you did to be forgiven.” Colbert’s comments to Kimmel seem to underscore that Colbert didn’t intend to offer Spicer any sort of absolution, even if many in the audience took it that way. Colbert has yet to address the criticism of the Spicer bit; it’s likely if he ever does, it will come first via his own show.